Marine Biology, one of the most all-encompassing fields of Oceanography, is concerned with the study of life in ocean and all of its biological manifestations. Marine biology relate to all marine organisms from small planktons to very large whales. Those who specialise in this field are known as Marine biologists. Marine biologists study plants, animals and micro-organisms that live in the sea. A marine biologist collect and analyze biological data, study plant life, identify animal species and their behaviour, research environmental effects, communicate findings to the public and do much more. The field of Marine Biology is vast and encompasses many different specialties and career paths. As there are many topics of study within the field of Marine biology, one can select an area of particular interest in which to specialize. Specializations can be based on a particular species, organism, behavior, technique or ecosystem. A Marine Biology graduate could specialize in studying either large ocean animals, all the way down to microscopic organisms. Marine biologists perform varied tasks depending on their area of specialisation and the area they are working in. One of the emerging specialisation is Marine biotechnology research which is applicable in many areas. Biomedical field where research to develop drugs from marine organisms, and Molecular Biology where research is done on marine organisms- from microscopic bacteria, plants, and animals to marine mammals- to detect diseases, their exposure to pollutants and the source of pollutants effecting them, come under this field. Marine biotechnology field uses the latest breakthroughs in modern molecular biology, genetic engineering and cell science to solve basic problems in marine resource biology; to improve the production of medical, chemical, food, and energy resources from the ocean; and to develop new products and industries based on more efficient use of the ocean's resources. As a Marine Biologist, you will have to travel to different parts of the world. You will spend a lot of time both offshore and inland to gather data and observe for changes in the ocean and all organisms living in it. Marine biologists working in an office setting provide advice and counsel to businesses, environmental groups or government agencies. Marine biologists who teach in universities and colleges may teach classes exclusively, or they may be involved in research as well. 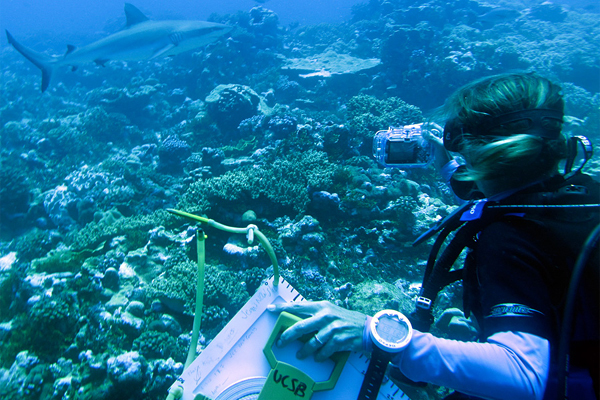 In Laboratories, Marine biologists spend the majority of their time conducting, documenting and analyzing research. The minimum educational requirement for an entry-level job as a Marine biologist is Bachelor of Science degree with a focus on Marine biology. However, most preferred is a Masters degree in Marine biology. For research and university teaching positions, PhD in Marine biology is required. Marine biology areas of study include systematics, ecology, anatomy, physiology, biochemistry, pathology, parasitology, reproduction and development, mariculture, ocean farming, pollution biology, energy resources and conservation. The most basic and required trait is an interest, curiosity and appreciation for marine environment and its inhabitants. Marine biologists find careers as Marine mammal specialists, naturalists, marine museum or aquarium administrators, educators, conservationists, and fisheries experts. Marine biologists can be employed by government and conservation agencies, environmental laboratories, marine laboratories, the water industry, coastal authorities, seaweed growing companies, fisheries and within the leisure and tourism industry. With the popularity of Eco-tourism, more opportunities are available within this sector. A marine biologist may work as Laboratory technician in universities, oceanographic laboratory, where they may be examining tiny creatures under a microscope, sequencing DNA, or observing animals in a tank. They may do research on a specific marine species, and teach at a college or university. They may also work in an marine aquarium or zoo, protecting marine organisms there. Some marine biologists go on to do consultancy work in a freelance capacity. The salary level of Marine Biologists can vary greatly depending on a wide variety of factors, such as where they work, their level of education and experience, and many other factors. Their salary level can also depend on whether they are employed by a private sector organization, a government agency or a non-profit organization. A marine biologist working in elite research institutions, earn more than those working with smaller institutions. In the beginning, one can earn between Rs 8,000 – Rs 12,000 in the public sector. The salary is slightly higher in the private sector. With a Ph.D., one can earn more than Rs 20, 000 per month. The salary of Marine biologists is relatively higher in foreign countries. Abroad Marine biologists working in entry-level positions make an average salary of $44,000 per year.